[160 Pages Report] The smart education and learning market size is expected to grow from USD 193.24 billion in 2016 to USD 586.04 billion by 2021, at a Compound Annual Growth Rate (CAGR) of 24.84%. The base year considered for the study is 2015 and the forecast period has been determined from 2016 to 2021. Smart education and learning is the technological advancement in the field of education, which changes the traditional methods of providing education with new methods based on smart devices and intelligent technology. There are many educational institutes and corporates that are adopting a comprehensive smart education model comprising both hardware and software solutions, according to their business demand at a fast pace. Smart education and learning solutions offer organizations, students, and educational institutes broad opportunities for flexible training and educational pursuits. With the technological advancements digital learning materials have become more readily accessible, content more engaging, interactive and refined, and the devices people use to access these resources are becoming more widely present and available than ever before. The factors contributing to the growth of global smart education market are the technological developments such as cloud computing, HTML formatting, wide adoption of mobile devices, and wide availability of internet. The major part of the market remains centered in the U.S. where these technologies have a strong foothold. Moreover, educational technologies such as gamification, big data, MOOC, Tin Can API, and social learning indicates a shift from traditional, text-heavy courses, to more dynamic, fun learning experience with fewer limitations and better opportunities for engagement and active participation of the learners. Thus, technological advancements in the form of dynamic and highly accessible digital educational materials is driving the global smart education market. To forecast the market size of market segments with respect to five main regions, namely, North America, Europe, Asia-Pacific (APAC), Middle East and Africa (MEA), and Latin America. This research study involves extensive usage of secondary sources, directories, and databases (such as Hoovers, Bloomberg, Businessweek, Factiva, and OneSource) to identify and collect information useful for this technical, market-oriented, and commercial aspect of the smart education market size. The research methodology used to estimate and forecast the market begins with capturing data on key vendor revenues through secondary research such as academic institute associations and educational associations. The bottom-up procedure is employed to arrive at the overall market size of the global smart education market from the revenue of the key players in the market. After arriving at the overall market size, the total market is split into several segments and subsegments, which are then verified through primary research by conducting extensive interviews with key people, such as CEOs, VPs, directors, and executives. 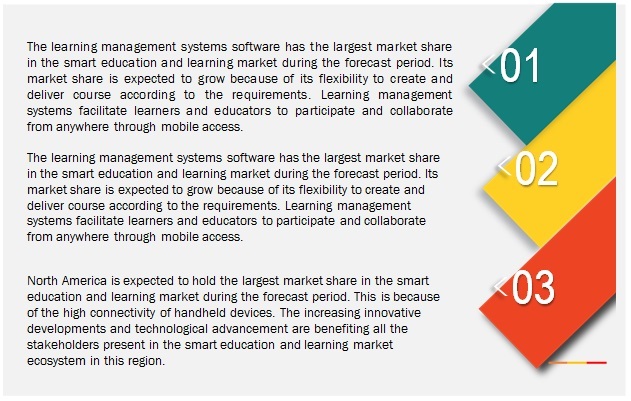 The smart education and learning market ecosystem comprises vendors such as Adobe Systems Inc. (California, U.S.), Blackboard (Washington D.C., U.S.), Educomp (Gurgaon, India), Cisco Systems Inc. (California, U.S.), McGraw-Hill Education (New York, U.S.), NIIT Limited (Gurgaon, India), Pearson Plc. (London, U.K.) Desire2Learn (Ontario, Canada), SumTotal System, Inc. (Florida, U.S.), Smart Technologies (Calgary, Canada), Ellucian Company L.P (Virginia, U.S.), Tata Interactive Systems (Mumbai, India), Promethean Inc. (Lancashire, U.K.), and Saba Software Inc. (California, U.S.). In May 2016, Adobe Systems acquired Livefyre, a content curator company that provides and develops content for various solutions and services. Adobe would use Livefyre’s content in its Adobe Experience Manager, so that user-generated content would be available in solutions. In October 2016, Blackboard acquired Fronteer, a U.K. based education technology company for teaching, learning, and student engagement. The acquisition would benefit Blackboard by making course content more accessible for learners, institutions, and instructors. In August 2016, Educomp Solutions Limited launched Smart STEM, Smart Class Pro, Health Set, and Go. The Smart STEM helps in making customized e-classrooms. 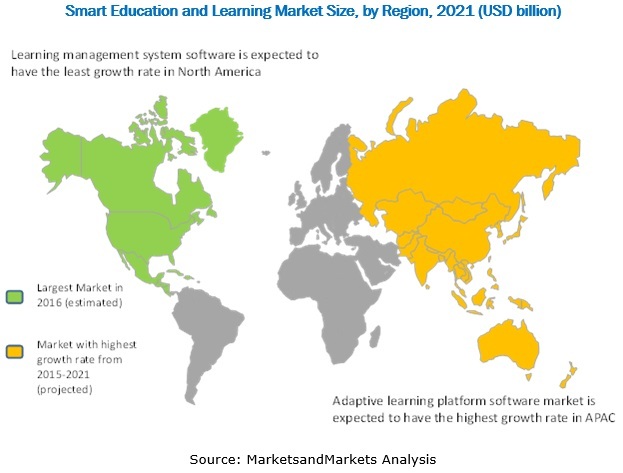 The smart education and learning market report is broadly segmented into the following hardware, software, service, educational content, learning mode, user, and region. MarketsandMarkets forecasts the smart education market to grow from USD 193.24 billion in 2016 to USD 586.04 billion by 2021, at a CAGR of 24.84%. Technological advancements, increased collaboration between hardware vendors and educational content providers, increase in the connectivity of the handheld devices, rising significance of eLearning in the academic as well as corporate setups to enhance the competency based on the productivity of the students and employees, widespread increase in the government initiatives in the growing markets such as APAC and MEA and technological advancements are some of the driving factors of the smart education market. Smart education and learning represents an emerging phase of the academic and corporate learning model that has the potential to truly transform the way students and working professionals will be trained in the coming years. Self-paced learning allows the people to learn anytime and from anywhere, whether they are travelling or at home. A holistic and strategic approach to smart education and learning can yield measurable interpersonal skills and development within the academic as well as corporate environment. Moreover, such approaches towards training and development leveraging technology creates sustainable competitive advantages for the organization. The objectives of the report are to define, describe, and forecast the smart education market size on the basis of product, user type, learning modes, and regions. The educational content has the largest market share in the smart education and learning product market during the forecast period. Its market share is expected to grow because of the rapid increase in the use of handheld devices to access educational apps for both students and working professionals. Among market segment by learning modes, the market based on collaborative learning mode is expected to have the largest market share during the forecast period. This is because of the ever-increasing significance of educator and learner collaboration in the academic as well as corporate setups. Adaptive learning market is projected to grow at the fastest rate during the forecast period. Increased collaboration between hardware vendors and educational content providers is driving the overall growth of smart education and learning market. Collaborative learning is an eLearning approach which enables the learners to interact with each other as well as the educators. In essence, the learners work together to share their knowledge, ideas and skills to achieve common or individual learning goals. In eLearning environments, this can be attained through an integration of various smart education hardware and software solutions like interactive white boards or displays, mobile devices, and an efficient LMS tool. This enables the students and the educator to interact through various modes such as live chats, online forums, message boards, instant messaging, informative video sharing or video chats. VILT refers to training that is delivered in a virtual environment where the instructors and participants are in disparate locations. This is a synchronous eLearning approach where the trainer uses an online tool or software to conduct the training, allowing a two-way communication between the trainer and learners in the real-time. Rather than taking lessons alone, students associating themselves with synchronous eLearning software or online courses with VILT feature can easily interact with fellow learners and teachers during the session through instant messaging. Simulation-based learning is a learning technique that can be applied to many disciplines that replicate substantial aspects of the real world in a fully interactive environment. Typically, a simulation-based eLearning solution allows the learners to practice their knowledge and skills, make decisions, mistakes in a completely risk-free environment. These solutions consist of comprehensive models that simulate operating environments, for instance, overall management of a company, of a start–up, or business functions within a company. What are the leading end-users of smart education market? North America is expected to hold the largest market share in 2016 and APAC is expected to grow at the highest rate in the market during the forecast period. A robust and efficient IT infrastructure and ever growing significance of technology in education has resulted in the wide adoption of the academic and business setups in this region. The increasing innovative developments in technologies are benefiting all the stakeholders present in the market. However, the lack of motivation and expertise among the end users and lack of resources and infrastructure in the developing economies would be the restraining factors for the smart education market. The key players in the smart education and learning market include Adobe Systems Inc. (California, U.S.), Blackboard (Washington D.C., U.S.), Educomp (Gurgaon, India), Cisco Systems Inc. (California, U.S.), McGraw-Hill Education (New York, U.S.), NIIT Limited (Gurgaon, India), Pearson Plc. (London, U.K.) Desire2Learn (Ontario, Canada), SumTotal System, Inc. (Florida, U.S.), Smart Technologies (Calgary, Canada), Ellucian Company L.P (Virginia, U.S.), Tata Interactive Systems (Mumbai, India), Promethean Inc. (Lancashire, U.K.), and Saba Software Inc. (California, U.S.). These players have adopted various strategies such as partnerships, agreements, mergers & acquisitions, and new product developments to achieve growth in the global smart education market.